Under this heading not only papier-maché, but also items made of "lineol", plaster and other non-plastic composite material. 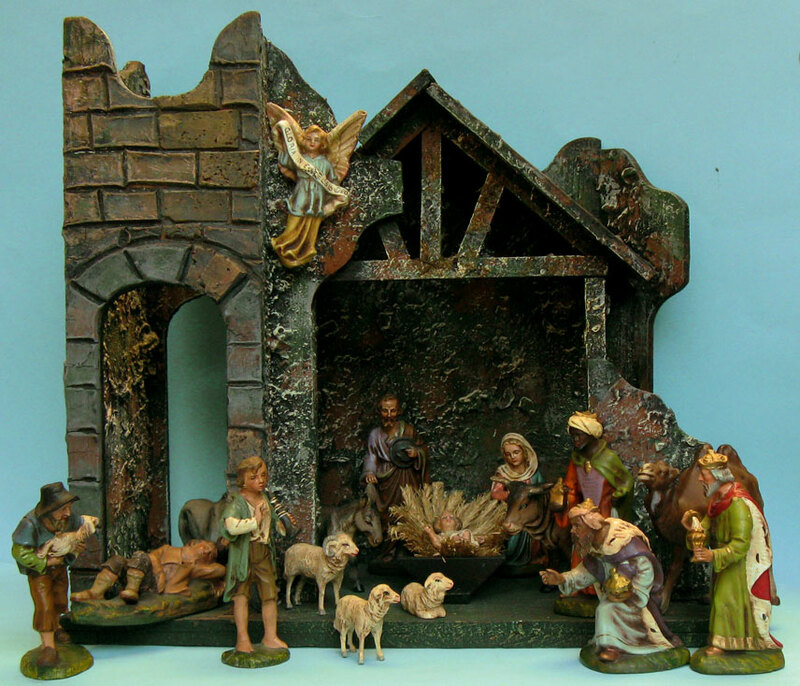 All nativity is brought together under the "Nativity" page, while under "Wood" figures in that material are there. The first set I bought was in Ghent, in the 1980s, from a person whose parents used to have a toy shop. He still had an invoice from Nazaire Beeusaert, Gentsche Steenweg 19, Deinze, on which he thought the Christmas set was invoiced, dated 1949. 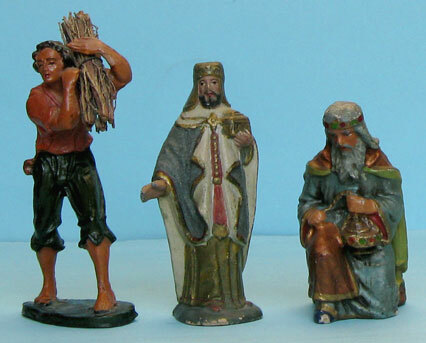 On the base of these figures is an impressed mark “NB Belgium”. Nazaire Beeusaert is known for the production of toys. 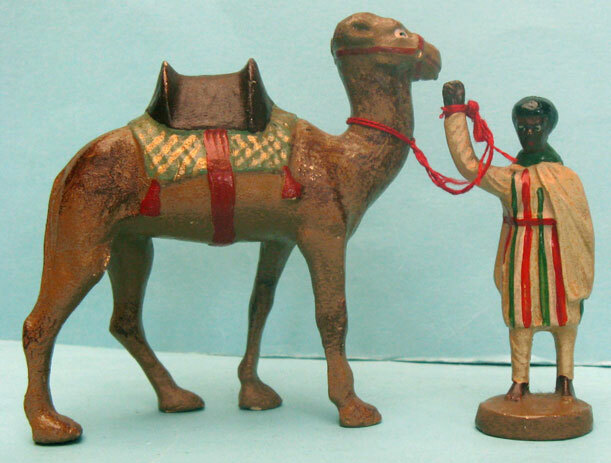 I have not been able to find when the firm was precisely founded, but in the 1920s and 1930s they produced horses, soldiers, fortresses, farms, ranches and figures for nativity scenes. 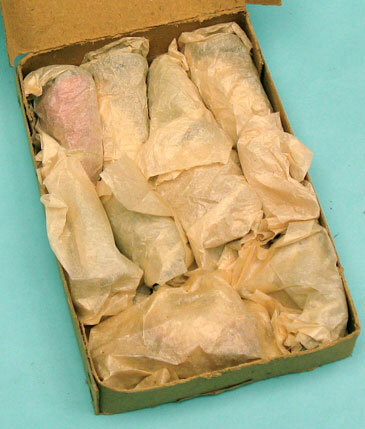 The “NB” was first used on soldiers in papier maché. Those produced for the warehouse “Le Bon Marché” were marked “BM”. 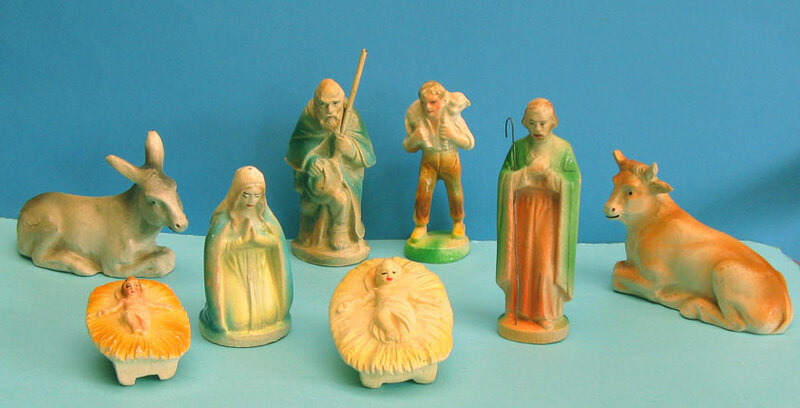 Figures for nativity scenes were produced in several formats (I know of at least two). They were marked “NB”. Each series was decorated with the same colors and patterns. 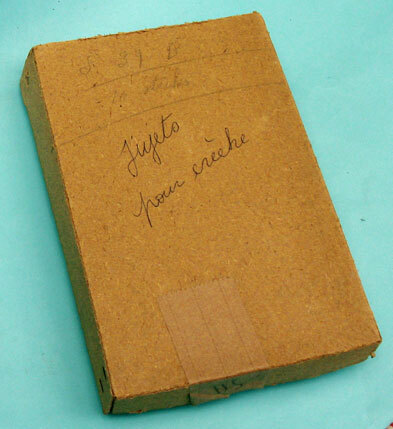 In 1921 a Mr. N. Beeusaert started a factory, producing cardboard toys. At present there still is a firm “Beeusaert”, wholesale trade in toys situated in the Ommegangstraat no. 60, in Deinze (Petegem-aan-de-Leie) with its registered office in the Gentse Steenweg 19, in Deinze. So this must be the same firm, still in existence today. - the book “Speelgoed – Made in Belgium” by Paul Herman. Mrs. Beeusaert, the widow of the eldest son of the founder and now an old lady, has been kind enough to confirm that the above is correct. This was several years ago and she also told me that some old molds were still about and now I am delighted that recently several of these original molds are shown on the Torck pedalcars site under "NB". 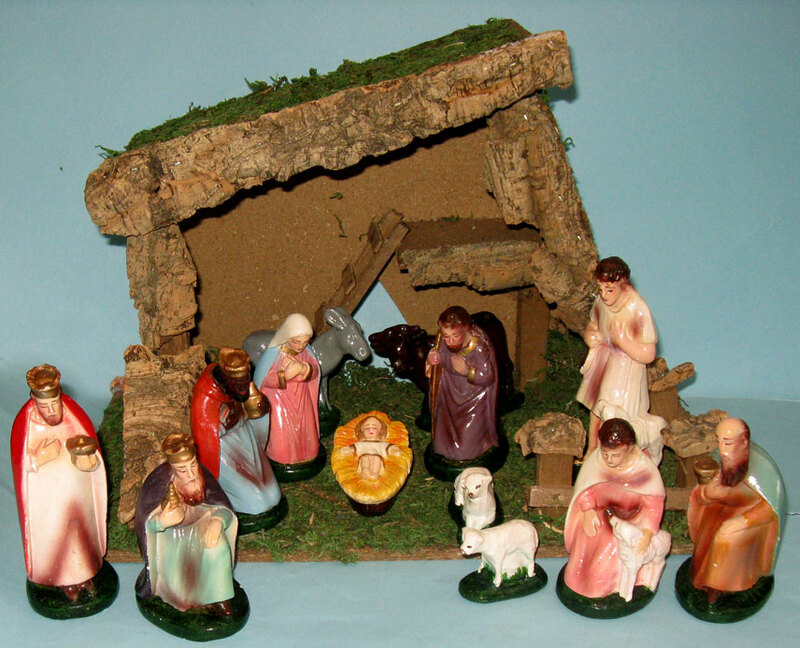 Production of the nativity figures started in 1944 up to the 1960s, when plastic figures, such as Italian, became available. This stable is also a Nazaire Beeusaert product. Judging by the base it is probably made of hardboard, covered with plaster (?) and the base secured with three wooden slats. It is 25cm high. The round paper label on the base reads "39/52", being the model number but usually mentioned as "3952", while the round stamp reads "NB 04 MADE IN BELGIUM", also being a mistery because this stamp was used for the NB horses, the "04" referring to the size. (ref. Luc Van Wanzeele). This stable is also a Nazaire Beeusaert product, judging by the base, the colors and the pave to the inside. The only marking is on the base, in pencil, what looks like "WE/95". Dimensions: ca 40 x 23cm and 32,5cm high. 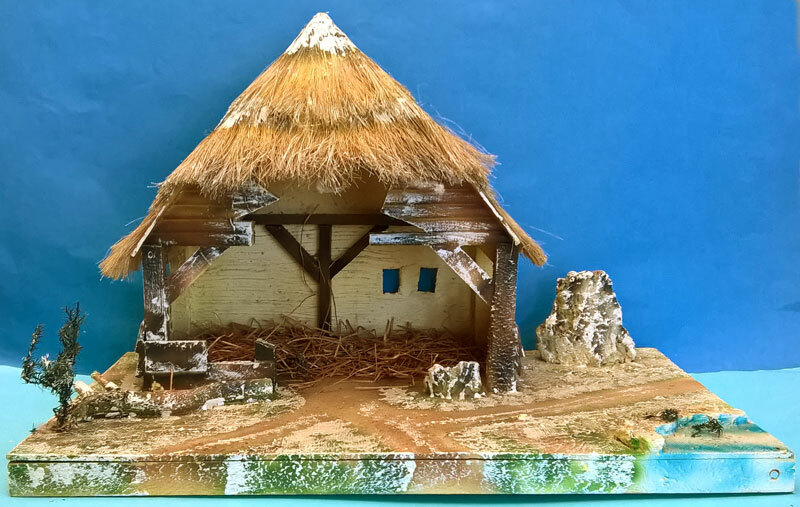 This is another Nazaire Beeusaert stable, with straw roof. It is marked on the base with the number 3973. Dimensions: 50 x 30cm and 34cm high. The above two sets are of different height. 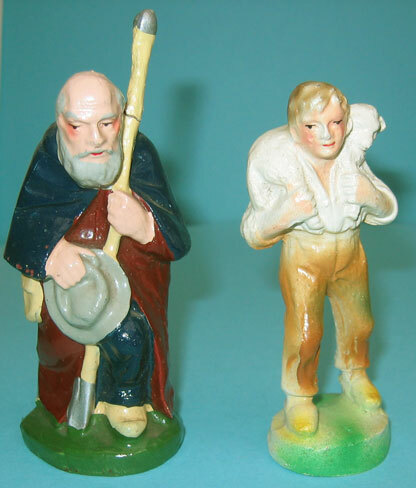 For comparison we take the figure of Jozef: in the top set he is 9,2 cm high and in the second photo he is 12 cm high. In both sets there are figures with green bases and brown bases; animals standing up and lying down. The above set is the small version. It came in the cardboard box, which the seller claimed is the original packing. 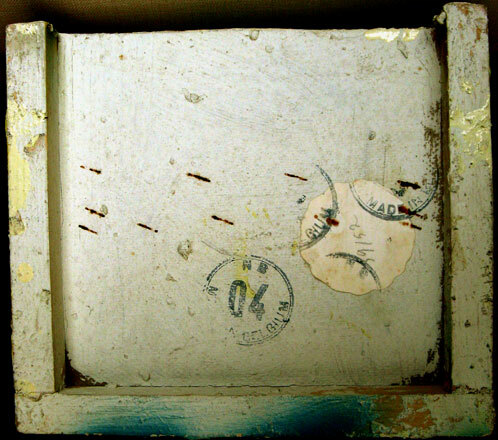 The box is marked in pencil with "S 39 B 10 stuks", of which the "39B" appears to be a guinine NB reference with 10 pieces. The tape is not the standard NB company, which was printed with toys. But I have been told that often, when it was not available, other tape was used. Here there is marking in pencil "IIS-". Also notice the smaller, standing donkey, being 7cm wide from nose to tail, while the standing one in the other small set is 9cm wide. Furthermore, on another NB box, with a picture glued on the lid, the ox and the donkey were of similar size. 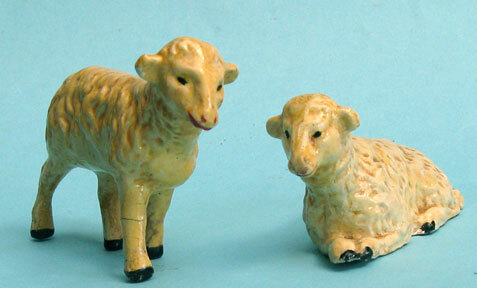 Above are the three sheep, one large and one small set. Except one, all have the black hooves, so I am not sure of its NB origin. Only the two lying down are marked. It was thought that one of the NB sheep features was the yellow patch in their eyes. Here are two, without the yellow, while the one lying down is marked. 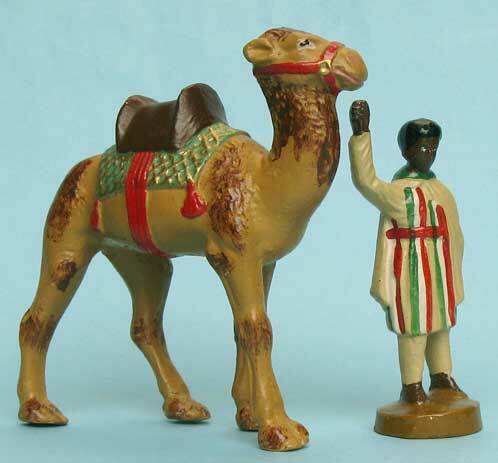 These two figures have been found separately. The left one is qua paint and decoration similar to the sets above. been done with an airbrush. Above are three bases with the "NB BELGIUM" mark. The white one is from the shepherd in the photo on the left. Notice that the base is not painted. The green one is from the old man: notice the hole. All the figures with a green and brown base in the two sets above are marked as the brown one. 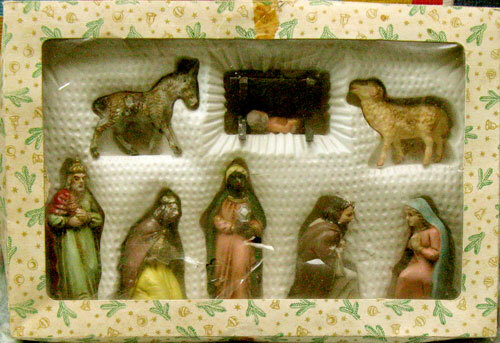 None of the baby Jesus are marked, although there is one with the pricing label of the Bon Marché still attached. here the driver is also unmarked. 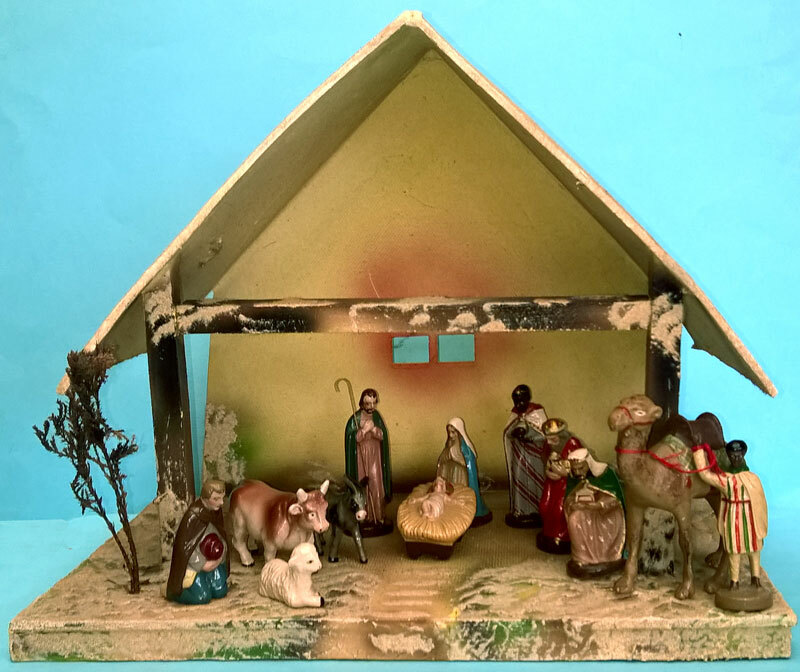 with the exception of the shepherd with the sheep and the small crib, I found them together in a box from an estate. Below a few other Nativity scenes. I do not collect them specially, but they came with other Christmas items or they took my fancy. 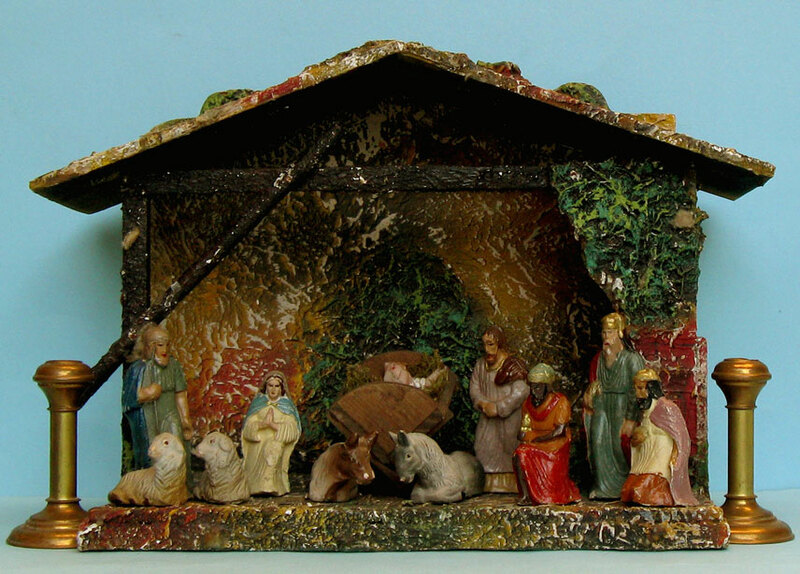 stable is ca 20cm high and Joseph, here kneeling, 5,5cm high. Ref. information from Sheila Bundy, 8/2017: It appears in the 1920's catalog of the firm Rudolph Apel in Oberlind and Tiefenlauter (1950), Germany. There were more figures available. These Three Kings however belong to another set. Italian nativity set found together. They are all marked "Italy" or "Italy C", except the small sheep. Largest figure is 11,5cm high. and although similar colors, not of the same production. 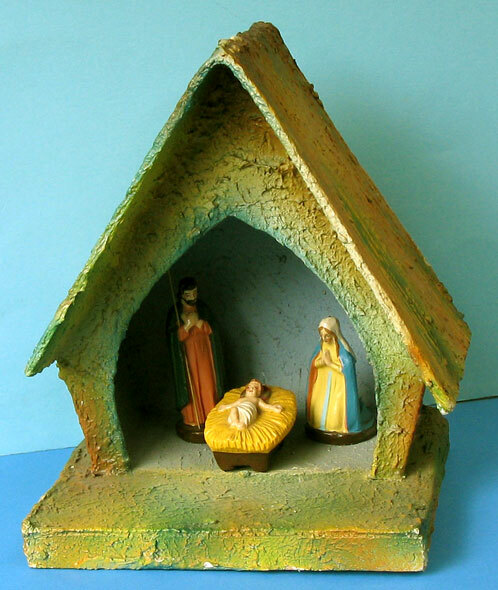 the box has a label with the number "058400"
This nativity set was a present. 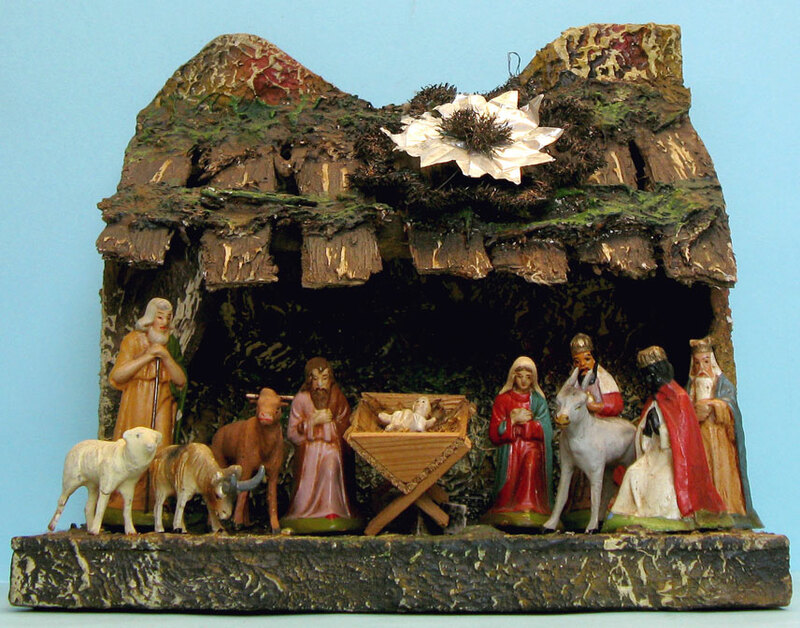 The stable is marked "Made in Italy", while the plaster figures are not. I believe some of them have been repainted because some have airbrush paint residues on the base. It was bought around 1955 .